1. Wash and pierce potatoes. Leave skins on. Place each potato on a piece of paper towel. 2. Microwave on high for 10-15 minutes or until done. 3. Remove paper towel. With serrated knife, cut potatoes into 1/4 inch (5 mm) slices. 4. 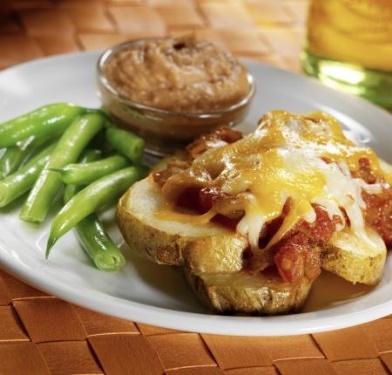 Place sliced potatoes in a lightly greased 8x12 inch (3L) microwave-safe baking dish. Pour the sour cream over the potatoes. Top with salsa and grated cheese. 5. Microwave for 4-1/2 minutes at medium-high power. Let sit for 5 minutes and serve. Leftovers keep well in the fridge for up to 2 days. Cooking for just two? Halve the recipe and use an 8x8 inch pan.